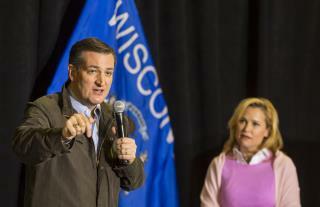 (Newser) – The GOP nomination race edged a little closer to becoming a bar brawl on Thursday when Ted Cruz called Donald Trump a "sniveling coward" and told him to "leave Heidi the hell alone." Cruz told reporters in Wisconsin, which holds the next GOP primary on April 5, that Trump is a "small and petty man" for targeting his wife with an insulting tweet, the New York Times reports. "Our spouses and our children are off-bounds," Cruz said, per the Washington Post. "It is not acceptable for a big, loud New York bully to attack my wife. It is not acceptable for him to make insults, to send nasty tweets." Cruz never denied the story. Read what he said carefully. He did not deny cheating on Heidi. He just called the story "garbage." This is lawyer talk for a non-denial. One of the women used to work for Ted. Now she works for Trump!!!! (Katrina Pierson) That's why Ted believes that Trump is behind this. Cruz shouldn't have blamed Trump. Now people are going to to put 2 & 2 together. Another woman was Carly Fiorina's campaign manager (Sarah Isgur Flores). Cruz allegedly paid hush money to Fiorina. Another is a speechwriter & author (Amanda Carpenter).